Salsa, at least most store-bought salsa, is loaded with salt. I have found several low-salt varieties I’be blogged about here. But I find most turn up the heat, pepper-wise, to compensate for less salt and I’m not a big hot pepper fan. 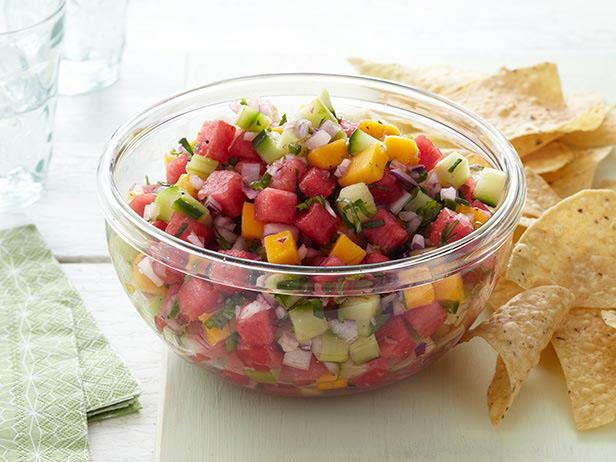 Watermelon salsa, check the Food Network link in my post for the recipe. So I was intrigued when I saw this Food Network recipe for watermelon salsa. I love watermelon and eat it often in the summer, and the winter when I can find good ones. So I’m planning to try this recipe, substituting real garlic for the garlic salt to cut the salt content. Here’s the ingredient list from the Food Network site, which attributes this recipe to country singer Trisha Yearwood. Is she really doing her own cooking? Call me skeptical, but if so, thanks for the recipe Trisha.